A treatment utilizing a type 5 phosphodiesterase (PDE5) inhibitor in a long-term course to halt or treat either penile tunical fibrosis or corporal tissue fibrosis. The type of drug utilized in the treatment. The specific types of fibrosis-related conditions. The method of treatment administration. The duration of the treatment. PTAB found that the claims were obvious given the combination of several existing references. By pairing references Montorsi and Whitaker alongside Porst, one could surmise that the administration of a PDE5 inhibitor at a specific dose over a “long-term regimen” (where increased dose frequency improved results) could treat erectile dysfunction, potentially as a result of “reversal of circulatory dysfunctions.” As such, PTAB found the ‘903 patent invalid on grounds of obviousness. 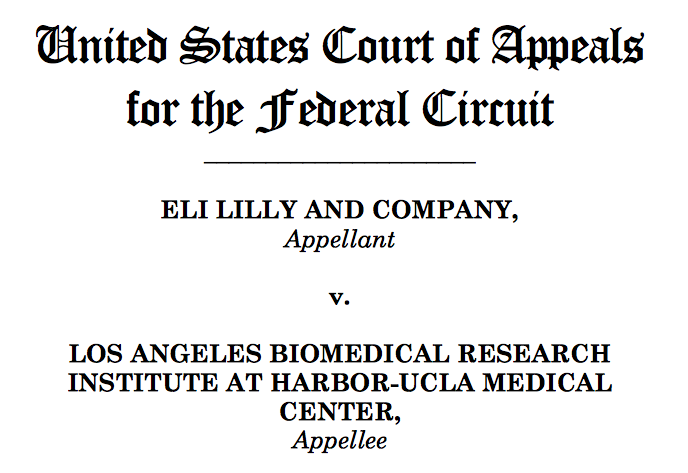 Both IPRs were appealed (2014-00693 by Lilly and 2014-00752 by LAB) and decisions were released today (28 Feb 2017): PTAB’s decision on IPR 2014-00693 was affirmed as not anticipated by the Federal Circuit while their decision on IPR 2014-00752 was vacated and remanded (meaning it is returned to PTAB for a new decision to be made per the logic of the Federal Circuit) so the obviousness of patent is still in question. The Federal Circuit cited that Whitaker’s definition of daily administration ranged from three days to three weeks (far less than the required 45 days described in ‘903) in their affirmation. On the subject of obviousness, the Federal Circuit determined that PTAB allowed too broad a reading of the phrase "an individual with … penile tunical fibrosis” such that it included patients with erectile dysfunction potentially unrelated to diagnosable penile tunical fibrosis or corporal tissue fibrosis. The phrase, the Federal Circuit argued, is designed to specifically limit the application of ‘903 to those with legitimate fibrosis, disqualifying the motivation-to-combine the references mentioned in 2014-00752 because they are specific to generic erectile dysfunction and not the treatment of fibrosis. In sum, ‘903 was affirmed to be not anticipated and is awaiting further decision on the grounds of its obviousness. Finally, LAB attempted to cite a provisional patent application filed in 2002 as a priority exemption. They were found to be not entitled to priority because no specific dosage was mentioned in the provisional application while the ‘903 patent hinges on the specifically described dosages.